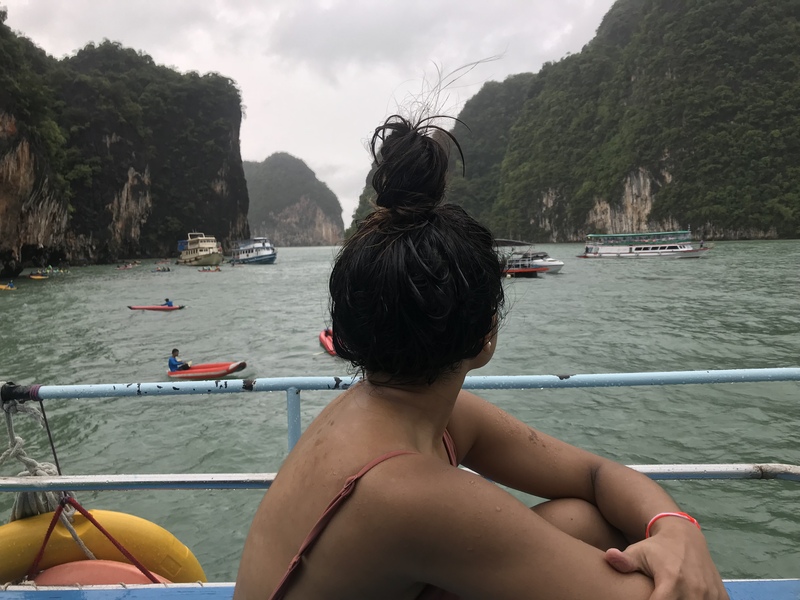 Mary-Anne Meerasabeer is a student in the Master of Global Affairs program and Collaborative Specialization in Contemporary East and Southeast Asian Studies. Thailand has achieved notable social and economic development in the last four decades amidst political uncertainty. However, with slower economic growth and the risk of being caught in the middle-income trap, poverty and inequality still pose significant challenges. In turn, prior to starting my summer internship at CanCham Thailand (the Thai-Canadian Chamber of Commerce), I was not expecting that environmental sustainability would be amongst the nation’s top priorities. Environmental protection is among the four main objectives of the Thailand 4.0 economic model. The government aims to “create an economic system capable of adjusting to climate change and creating low carbon societies.” Its first trial is with the Eastern Economic Corridor (EEC) – a pilot project set to transform three of Thailand’s eastern provinces into technological manufacturing and service hubs by 2021 and a popular point of interest for foreign investors. Thailand’s first and largest industrial zone, the eastern seaboard, has been scrutinized in local Thai news outlets as being blighted by industrial garbage, wastewater and air pollution from factories. These concerns have not gone ignored. At a luncheon with Deputy Secretary General of the EEC Office, Dr. Luxmon Attapich (which I was honoured to attend), she assured us that the project’s environmental impact is indeed a priority. Fifteen projects worth 9 billion baht, organized into a five-year roadmap, are being established to tackle water treatment issues, maintain the mangrove forest, build more waste treatment facilities, and implement an Environmental Impact Assessment (EIA). Part of Thailand’s ongoing movement towards a more sustainable future is encouraging technology transfer and fostering capacity-building from global leaders. During my time here, I’ve learned that Canada is an increasingly influential partner in Thailand’s sustainability movement. 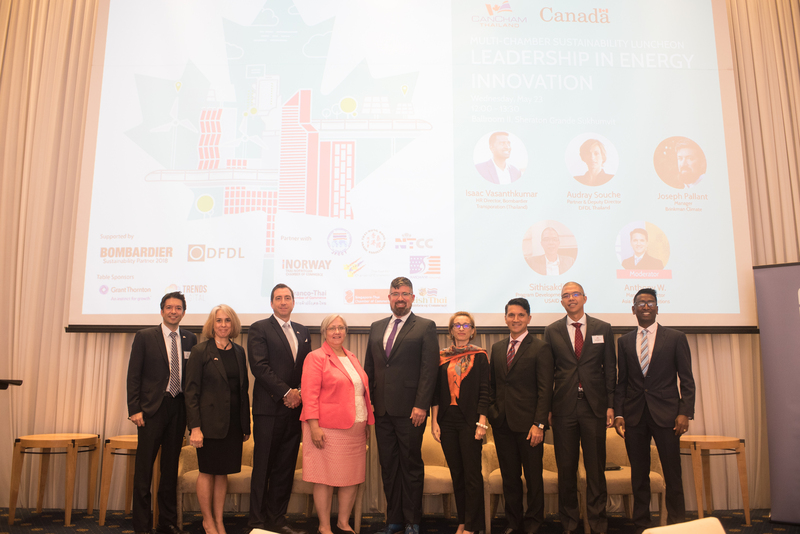 In May, CanCham Thailand hosted a luncheon on Leadership in Energy Innovation that explored sustainable energy solutions in areas of blockchain for energy, clean power, energy policy, and transportation in Thailand. 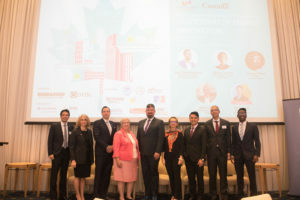 Featuring the Manager of Vancouver’s Brinkman Climate, Joseph Pallant, and HR Director Asia-Pacific at Bombardier, Isaac Vasanthkumar, amongst other notables, the event was sold out with a waiting list of people eager to hear about Canadian ideas and technologies. Additionally, Bombardier has become the new railway systems integrator for the North and South Sukhumvit Skytrain line extension in Bangkok, and just last year signed two contracts to supply its energy efficient INNOVIA Monorail 300 system into two of Bangkok’s new transit lines. Bombardier is also helping to build Thailand’s capacity to explore and create energy-efficient solutions for themselves. Eighty percent of Bombardier’s employees are Thai and the multinational corporation has partnered with three universities in Thailand to empower young people to enter the field of transportation engineering. Joining forces, CanCham Thailand recently signed a “Sustainability and Smart Business” partnership with Bombardier for the 2018 year. View of Phang Nga Bay, Thailand. The importance of sustainable living is not a new concept in Thailand. Rather, environmentalism has been supported by the highest power in the nation— the Royal Family. The “Sufficiency Economy Philosophy (SEP),” termed by the late H.M. King Bhumibol Adulyadej, encourages a balanced way of living based on the three principles of moderation, reasonableness, and self-immunity. This has aligned well with the United Nations’ Sustainable Development Goals (SDGs) and maintained solidarity with the Paris Agreement over the years. Today, Late King Bhumibol’s philosophy is adapted to promote contemporary environmental sustainability amidst Thailand’s drive to its 4.0 goals and beyond. Residents are encouraged to never overexploit or abuse the environment and to live in harmony with nature. Despite exciting developments in Thailand’s sustainability platform and visible solidarity with global climate change initiatives, there is still much more work to be done. While the water treatment facilities in Thailand are usually in good condition, the pipe systems that deliver the water are not. Thailand’s locals and tourists are forced to purchase bottles of water as the safest source of drinking water. It is even free to get large quantities of bottled water delivered from the local BigC or Tesco grocery stores. On top of this, restaurants and food stands use unnecessary amounts of plastic bags and straws in packaging their products. 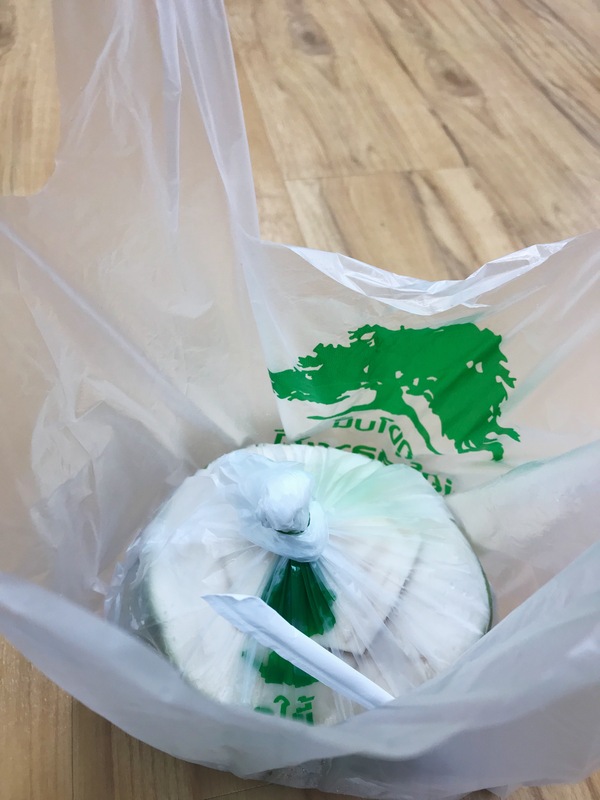 7-Eleven employees place straws in my bag without question every time I purchase a beverage and I am often given two plastic bags when purchasing fruit from street vendors. Consequently, Thailand produces about 2.3 million tons of plastic annually without suitable recycling systems even in Bangkok. Thailand has been identified as among the world’s biggest contributors to ocean waste and just this summer had to close the famed Maya Bay due to excessive amounts of plastic floating on the surface of the sea and washed up along the beaches. Typical packaging method of Bangkok restaurants and vendors. 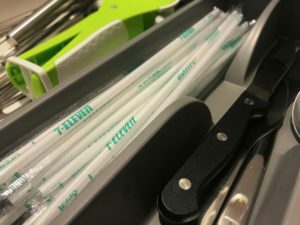 My growing collection of unused 7-Eleven branded straws. Like many developing countries, Thailand faces significant threats to its populations and productive capacities due to climate change. Its agricultural sector employs a large portion of the labour force (a powerful block of political actors) and fuels its export-driven economy. A staple in Thai cuisine, rice is the second-most valuable agricultural export in Thailand. Tourism around its 3,200 kilometres of coastline also contributes significantly to the economy. It was apparent to me while exploring the islands of Phang Nga Bay near Phuket and rock climbing the limestone formations at Rai Leh Beach, Krabi, that people come from around the globe just to see these sights. According to the Climate Institute, one degree of warming would destroy rice crops, causing a devastating rise in prices. Sea level rise would submerge Thailand’s prosperous and vibrant tourist destinations. Adaptation and mitigation efforts are critical to Thailand’s national security. Today, achieving economic prosperity at the cost of environmental degradation is viewed by the global community as poor decision making. While interning in Bangkok, I realized that this issue has gained considerable weight in one of contemporary Southeast Asia’s most developed economies. I am hopeful that a waste separation system or a ban of single-use plastics will likely develop sometime in the future alongside a transformation in consumer and industry mindsets. It is likely that this will come with more initiatives that educate locals on the urgency of the global climate change issue. Despite being a Canadian who recycles and composts at home, I realized that it can be easy to fall into bad habits when it’s so inconvenient to go against the grain. Change comes from conscious effort to go out of your way to politely return extra straws and plastic bags, taking shorter showers, washing clothes with cold water, and using reusable water bottles whenever possible. Among my proudest moments were the days that I carried one large water bottle in each hand in 30-degree heat to reduce my plastic bag use, even while being subject to quizzical looks from the locals.